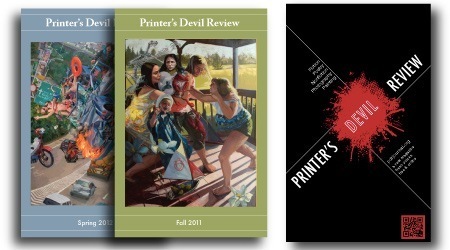 After four years of providing open access to original ﬁction, poetry, essays, and ﬁne art, Printer’s Devil Review will oﬃcially cease publication on October 1, 2015. We will maintain our online presence indeﬁnitely at pdrjournal.org, where free PDF downloads of all of our issues will remain available. Print versions of the magazine will continue to be available for purchase at Lulu.com. Printer’s Devil Review, published by Black Key Press, was an open access arts and letters journal publishing online and print issues from 2011-2014. Printer’s Devil Review is a (primarily) online journal featuring ﬁction (short stories and excerpts from novels), poetry, non ﬁction, and visual art. All of our issues are available for free download as PDFs and some are available as free ebooks. Print versions of issues are available for purchase at Lulu.com. Independent and open access, PDR provides emerging writers and artists with access to publication and inquisitive readers with new voices and visions. PDR is dedicated to providing emerging writers and artists with access to publication. We exist to support, distribute, and promote new writing and art. We want to eliminate any barriers that might separate writers and artists from the communities that form around their work. That’s why access to PDR is free of charge to anyone with an internet connection, anywhere in the world.